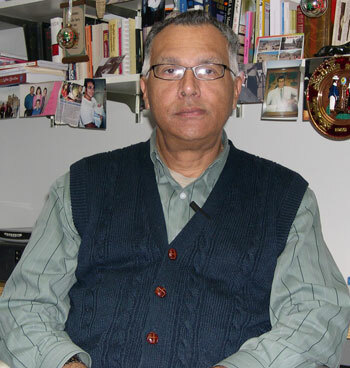 Spanish professor Rafael Saumell-Munoz's personal history and his research on Cuba has led to his acceptance into the exclusive Academia de la Historia de Cuba (Exilio). As someone who has experienced life under Fidel Castro’s dictatorship first-hand, SHSU Spanish professor Rafael Saumell-Muñoz has had a lot to say on the subject throughout the years. His first collection of unpublished, “politically incorrect” short stories led to a five-year imprisonment in Cuba in 1981. Since then, he has written a number of articles, papers and books on Cuban literature, prison narratives and the histories of human rights and the prison system in Cuba. These scholarly contributions recently earned him unanimous election into the Academia de la Historia de Cuba (Exilio), an exclusive scholarly organization dedicated to telling its version of Cuban history. Most of these people are “dissidents,” people who have been exiled (hence “Exilio”) for similar criticisms of the Cuban government or simply do not accept the government’s version, Saumell-Muñoz said. An award-winning TV writer and producer while living in Cuba in the 70s, a “so-called friend” of Saumell-Muñoz, whom he later found out was a secret police informant, told the police about Saumell-Muñoz’s “politically incorrect” collection of short stories. Labeled “enemy propaganda” by the Cuban penal code, Saumell-Muñoz was sentenced to five years in prison. “I knew that it was a criticism of the present situation of Cuba at the time, but it would never cross my mind that it would be considered enemy propaganda for two reasons: in order to consider something propaganda, it has to be public, but if a book has not been published, how can you call it public?” he said. “If you label something enemy propaganda, that document must be paid for by a foreign government who wants to use the document to attack another government. Obviously I wasn’t paid by anyone; I was just moved by my consciousness. When he was released in 1986, he applied for an American visa, which was granted in 1988, and eventually became a graduate student at Washington University in St. Louis, Mo., where he completed his doctorate. In May, Saumell-Muñoz will travel to Miami, Fla., the academy’s headquarters, to read his paper on the Cuban 19th Century poet José María Heredia as his formal acceptance to the group’s invitation. His memoirs will be published in Spain later this year.